Manaus (Agenzia Fides) - Panama will host the World Youth Day (WYD) from 22 to 27 January. One of the participants is Aylla Emanuele Silveira, a young 21-year-old woman who will represent the Magis House of Manaus and has been taking part in the activities for about two years. She is a student of architecture and urban planning at the Federal University of Amazonia, and is a collaborator in the socio-environmental area of the Jesuit organization, and carries out awareness activities, based on Laudato Si and on the Synod for Amazon, as she herself reports to Agenzia Fides. 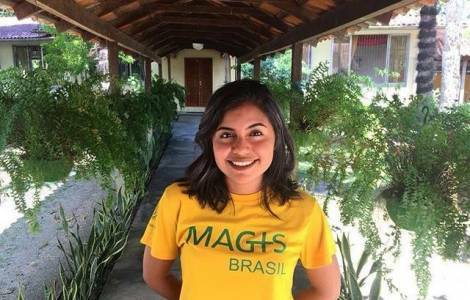 Together with 30 other young Brazilians who are part of Magis Brazil, she will attend the Magis Houses meeting that will take place in Guatemala, in the days preceding WYD, explains Aylla Silveira to Fides. She already participated in World Youth Day in Rio de Janeiro, in 2013, representing the Youth Ministry of the Archdiocese of Manaus. "I was very young, but it was a very big impact, given the large number of young people and different expressions" says the young woman to Fides. Her expectation for WYD 2019 is even greater "due to the cultural impact of getting to know different people, to live a greater experience", according to Aylla Silveira. The young woman brings her Amazonian identity to WYD, "in an attempt to show the Amazon region that lives in us, to make others discover it". What she hopes to report is "all that she will hear from young people coming from all over the world and from Pope Francis, who is an iconic and marvelous figure for me, who calls us to be a Church that goes forth, to be more for others, as St. Ignatius teaches us. "Besides this, she expects "to see the reality of others, of other cultures, to learn more about diversity and respect, something which, young Brazilians, need very much".